Description: Great for barbecues, picnics or any outdoor event. 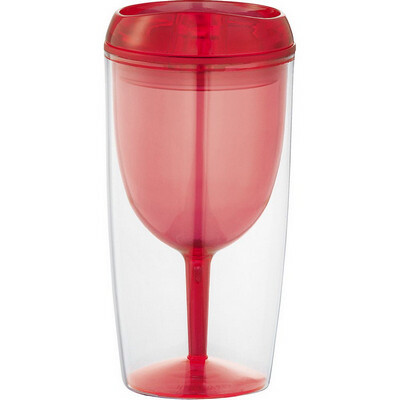 The cup is double-wall acrylic with the inner wall shaped like a wine glass. It is BPA free and has a 295ml capacity. Features: Great to portion your favourite beverage. BPA free, 295ml capacity. Packaging: In a polybag and bubblebag Colour: Red Material: Acrylic Product Size: 175mm(h) x 85mm(diameter) Freight details : 24 per carton, 5.7kgs, 36.5 x 29.5 x 39.5cms; Decoration Type(s): Colour Print / Full Colour Print Decoration Area: Pad: 45mm(h) x 45mm(w). Price includes : 1 Colour 1 Position Print. Setup is included.